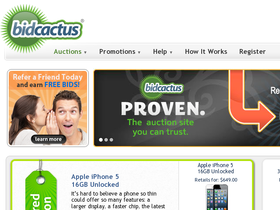 If you are looking for web-based auctioning, look no further than BidCactus, online at BidCactus.com. With auctions starting from $0.01, BidCactus provides its customers with gift cards and products from cutting edge product lines offered within the digital and electronics communities. BidCactus's auctions include products from popular stores such as Kohl's, Home Depot, WalMart, Target, JCPenny, Sear's, Amazon, Shell, Macy's, Best Buy, eBay, Outback Steakhouse, Toys "R" Us, Red Lobster, iTunes, Bed Bath & Beyond, Barnes & Noble, Chili's, and many more. For all the best BidCactus coupons, BidCactus promotions, and BidCactus deals, check out RetailSteal.com. Once you pay for the item you bid on, your purchase will be shipped to the address you provide in your account information. BidCactus nows ships to both the United States and Canada. See BidCactus.com for details. Use this coupon code at BidCactus.com for 10 free bids with purchase of 30 bidpack. Click here for this one time offer. At BidCactus, use the coupon code to save $10 on any bidpack. Click link for savings. Use this code at Bidcactus.com between 2am and 7am EST and get 5% off. Click link now. Buy a 50 bidpack and get 5 free bids from BidCactus.com - get started! Use this code at Bidcactus.com between 6pm and 8pm ET to get 5% off. Click link and save. Save up to 90% off retail prices at Bidcactus.com. Click link to start. Get a $100 gift card to shops like JCPenny and Walmart for only a buck from BidCactus.com. Save now. Enter our coupon code at checkout at BidCactus today and save $10 on your first winning auction. Use this coupon code on BidCactus to save $16 when you purchase a 250 bidpack. Click to save.